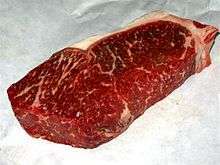 The strip steak, also called a New York strip (only outside New York) or a Kansas City strip steak (US), or a sirloin steak (UK/AU/NZ/ZA), is a cut of beef steaks from the short loin. It consists of a muscle that does little work, the longissimus, making the meat particularly tender, though not as tender as the nearby rib eye or tenderloin. Fat content of the strip is somewhere between the two cuts. Unlike the tenderloin, the short loin is a sizable muscle, allowing it to be cut into larger portions. According to the National Cattlemen's Beef Association, the steak is marketed under various names, including Ambassador Steak, Boneless Club Steak, Hotel-Style Steak, Kansas City Steak, New York Steak, and Veiny Steak. In New Zealand and Australia, it is known as a striploin steak and can be found in the Handbook of Australian Meat under codes 2140 to 2143. In Canada, most meat purveyors refer to this cut as a strip loin. Delmonico's Restaurant, an operation opened in New York City in 1827, offered as one of its signature dishes a cut from the short loin called a Delmonico steak. 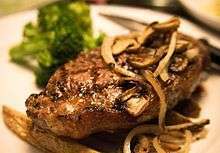 Due to its association with the city, it is often referred to as a New York strip steak. 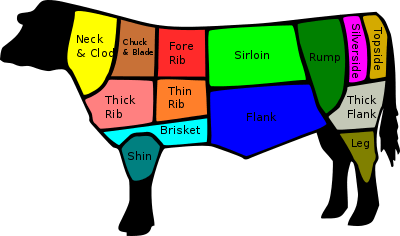 When still attached to the bone, and with a piece of the tenderloin also included, the strip steak becomes a T-bone steak or a porterhouse steak, the difference being that the porterhouse has a larger portion of tenderloin included. 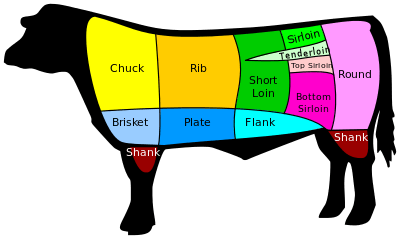 The strip steak may be sold with or without the bone. Strip steaks may be substituted for most recipes calling for T-bone and porterhouse steaks, and sometimes for fillet and rib eye steaks. ↑ Herbst, Sharon. "Kansas City Strip Steak". Epicurious. Barron's Educational Services. Retrieved 28 November 2011. ↑ "Understanding the Cuts". farmfreshbeef.org. Retrieved 2014-10-30. ↑ "Beef Cuts Chart" (PDF). australian-beef.com. Meat & Livestock Australia, Ltd. Retrieved 2016-11-13. ↑ "Australian RFP Cut Code Reference 2016 Edition" (PDF). ausmeat.com.au. Aus-Meat, Ltd. Retrieved 2016-11-13. ↑ "Beef - Meat Cuts Manual". inspection.gc.ca. Canadian Food Inspection Agency. Retrieved 2016-04-07.